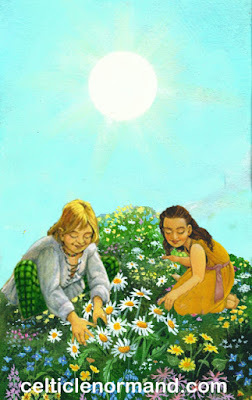 The Celtic Lenormand Oracle: Here Comes The Sun! How very very clever! Your Sun is marvelous. Now where is the Celtic Tarot? Perfect! When I first saw the image I really thought it was a complete card, not a mashup. You did a great job and it definitely has a similar feel to the Thoth Sun! And clever to do a Zebrowski! What a beautiful image! The collage is seamless - I also thought it was just a card I hadn't seen from the deck before. Love the collage that doesn't look collaged...great artwork and an intriguing interpretation of the many little Suns in our hands! It looks great Chloe, and what a great idea!! Wow, that's beautiful, Chloe! It's a great idea...and a great interpretation, as Aisling already said.